My mom is shaking her head at me. At least, that's how I imagine her; she's actually thousands of miles away right now, in Panama. My little sister Jenny is about to give birth to grandbaby number 8, and Mom is there to help. My mom grew up on a dairy farm in central Oregon, outside of Madras. My grandparents had already rented the land to a younger family by the time I was a little girl, so I never got to milk a cow myself. But still, my four siblings and I grew up emotionally close to the land, with a highly developed sense of where food comes from. When we visited Grammy and Grampy, we would play in the mint fields, jumping over irrigation ditches and finding frogs among the plants. Later, my family moved to Montana, where we scratched a garden in the mountainous dirt, were given huge quantities of elk and deer meat, and bought raw milk in huge, unkempt glass bottles from a "neighbor" (they were only 15 miles away). Montana was where, at the age of 10, I first learned to make bread, where I first smelled the noxious fumes of oxtail stew, and where home-cultured yogurt became part of our daily life. 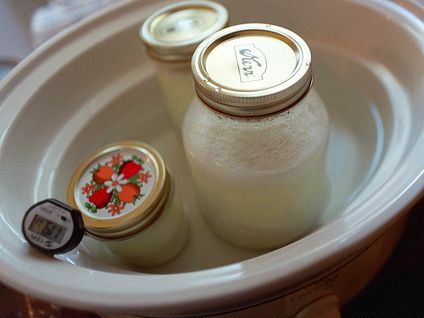 I don't remember how my mother made yogurt, but I remember thinking that homemade yogurt, and the possession of raw milk, were especially wonderful characteristics of living in that rough country. (I also remember stomping the ground and insisting that I would never eat oxtail stew.) The details are fuzzy, but I'll hazard a guess that Mom didn't make yogurt while obsessively checking and re-checking the instructions on her laptop on a nearby counter. Nope, that's me, her incorrigible daughter, who collects passions like some women collect shoes (OK, so I have lots of shoes, too), who does everything the hard way despite modern conveniences. Whose children will happily eat carton after carton of Tillamook yogurt, but who thus far have refused to eat the healthier options I've provided — organic plain yogurt with fruit spread swirled in. Silly mommy. At Trader Joe's, I hemmed and hawed for nearly 20 minutes. I had a few dollars in my pocket, and I was there to buy what's known in the field of culturing as a "starter." I really wanted organic, but the only organic options seemed to have fillers and sweeteners and such, exactly the sort of thing I'm trying to avoid, both for philosophical and practical reasons. I ended up with the carton of plain European-style yogurt. As I handed the jocular cashier my $2, I felt as if I should explain why, on a Sunday night with lines backed up to the freezer aisle, I was buying only one item. In order to make yogurt, you need a starter with active, live cultures. They're now easy to find since they were proven to be so healthy for one's digestive system back in the 1990s. (And now I'm singing the theme to the Activia commercial, and shaking my head — as if Dannon has somehow invented the concept of bacteria.) But I vaguely remember it being hard for my mom to find the starter, what with us being out in the middle of nowhere, not to mention the grocery minefield that was 1982. I'm lucky now, I think, as I pour two glass jugs of milk into a big pot and balance my thermometer on the edge. After gathering and cursorily sterilizing all my equipment — that big stainless-steel pot, glass jars and canning lids, a glass measuring cup, a stainless-steel spoon — I set to work, stirring yogurt while I cook dinner for friends. We've invited them over, and as usual, life got in the way of hostess perfection. While they eat olives and the contraband Lay's chips my husband snuck in, I am cooking Oregonzola soufflés and kale and is there anything else to eat? All while I am making four quarts of yogurt. I'd shake my head at me, too, always thinking I can do two-and-a-half times what a typical human being can do. No matter. I chat with Larissa and watch the temperature rise slowly, slowly to 190ish degrees Fahrenheit. She is unfazed as I heat an enormous pot (the only one big enough; it's several gallons and I bought it at a garage sale for $2) to boil my jars and lids. Larissa reads all my blog posts. It is really hard to cook the yolks with this extra-extra-large pot on my normal-sized stove and I put it off a bit, glad it's Larissa in the kitchen with me and not anyone whose expectations are more in line with commonly held etiquette. Finally we have reached scalding, and I remove my pot of milk to the sink, where it will cool down to between 122 and 130 degrees. I am crumbling cheese as I do this, so I do not pay close attention, and I think I cool it down too fast. I decide not to worry about it and glop a few spoonfuls of starter into my measuring cup. I do not look at the measuring lines on the side, no, I dump a little of the cooled milk in too. I stir while I talk and back into the pot the mixture goes. I fill my jars messily and place them in my Crock-Pot, which never gets to exactly the right temperature but close is OK, right? In any case my thermometer keeps falling into my hot water, and I can't really read its digital output any more. I finish my soufflé and Larissa makes the greens and heats leftover handmade pasta and everyone declares that it is the most delicious thing they have ever tasted (and then they immediately leave for home because it is monstrously late). I do not eat any yogurt until the next morning, and I drizzle it with maple syrup and stand in the still-messy kitchen, eating it and imagining how I'll describe this one day. Sweet? No, that's a little too obvious. Is unctuous the right word? How about mellow and lovely and entirely creamy instead? I am rhapsodizing about this yogurt, but it is only yogurt, only milk heated and then cooled, only the work of some bacteria that have been working always. It is nothing new, nothing groundbreaking. I am not that special. That's as it should be. I should not be special; we should all be making these simple foods that have been stolen from us, ripped out of our hands with the authority of a stern parent who does not believe in us. "No, we shall make your yogurt!" Big Food proclaims. "We can read the thermometers better. It's hard. It's messy!" When we weren't looking, they put a bunch of sugar and gelatin and fillers in their yogurt. And then when we got hooked on the new kind of sweetness, this sharper, more demanding sweetness, they found something cheaper and sweeter: high-fructose corn syrup. The sweetness went chemical, screeching, in-your-face, but how could you know it was wrong? Yogurt was low-fat and low-calorie and good for a healthy digestive system. Yogurt became a leading health-delivery product. It was far too complicated ever to make this in tandem with a good dinner for some friends. I am not that special, but the yogurt that's being fed to you is even less so. It has no claim worth holding. Let go. Go to the store, buy only a bit of plain yogurt. Take your milk. Heat, cool, mix, and pour. Use it liberally. You can always make more; yogurt, like families, keeps growing, one begets another, mothers shaking heads as their children go out into the world and think they've invented everything anew. No.